Pretty sure that after this incident, Edna is on Santa's naughty (very naughty) list. It's the most wonderful time of the year...Edna and the sisterhood are bringing back our X rated Christmas challenge. This one is NOT for the faint of heart...but we'd love to see your super naughty Christmas projects!! 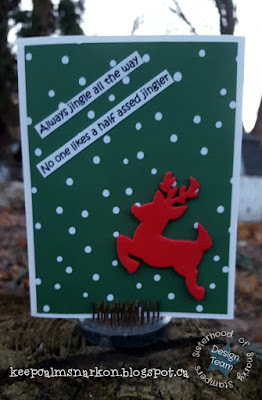 You can find all the details for the challenge on the SoSS BLOG and while you are there be sure to check out the very very naughty creations of my snarky sisters. Edna has made this one a month long challenge, so you have LOADS of time to make something really naughty. We will be back at ya on January 7, 2017 with our first challenge of the New Year. I love this card woman!! Great Job and Merry Christmas!! Okay, I think I like your mum. :D Great card! Great job. I enjoyed making cards this year as well. This is fabulous! And I love your Mom! LOL! Excellent job Sistah!